In torch song epilogue, the glitch adds affect and atmosphere to the initial image. The distortion has a sensibility as much analog as digital, suggestive of viewing the skyline from a train, or through condensation on the window -- yet remains unmistakably digital in origin. 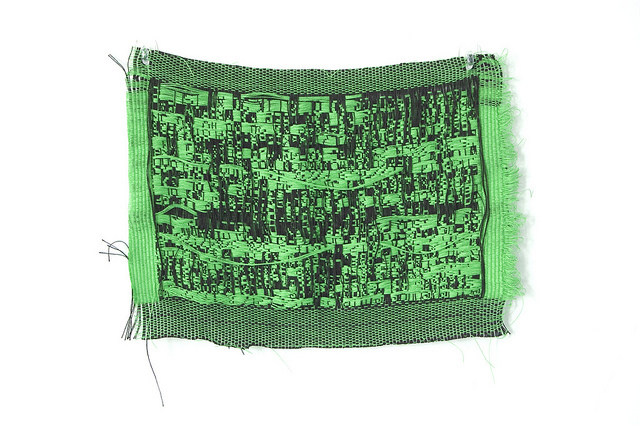 In her Untitled Screencaptures, Melissa Barron reconnects the computer to its origin in textiles. 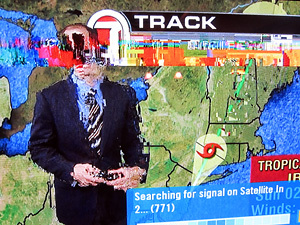 A variety of techniques are used to create glitchy images, such as databending the digital file, using weave structures that give the appearance of a glitch, and employing the invert & reverse functions of the loom. Stearn's The Quickening seeks out the inherent signature voices locked within the "programming" or the design of the machine. In this case, a DV deck is intentionally misused to transform material derived from the interactions of sine tones oscillating across the spectrum of physical perception. 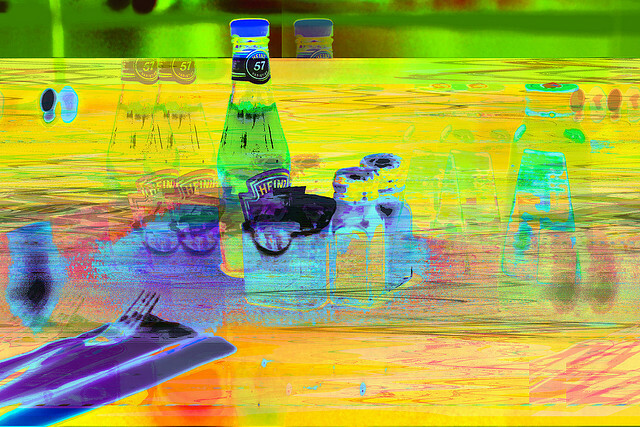 Neto's JPEG-LS bends were at first not understood as glitch; they have a feeling of control that is unusual in glitch practice. This, along with the sense of motion and the pseudo-3D character of the image, are artifacts of the file format and the source image Neto selected working in concert. Remeniscent of work such as Nam June Paik's Zen For Film, Lenscapped has no source material apart from dust on the lens. This input is subjected to analog distortion through VHS and then digital distortion through Flash. The Sector series experiments with broken automation. This image was created by applying sound effects to individual color channels of an image, using an audio editor. By working in a program that does not display images, the artist forgoes precise knowledge of how the changes will manifest. 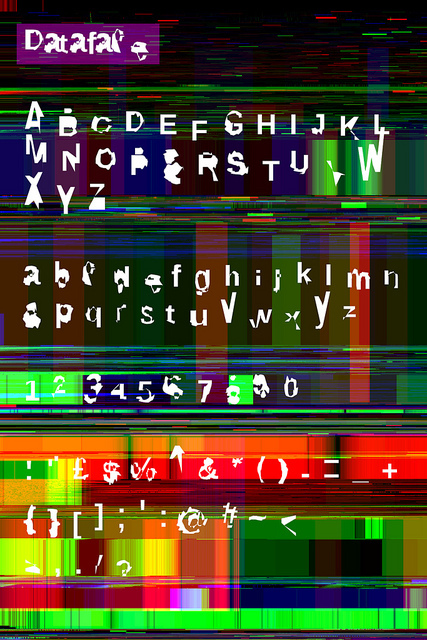 Dataface is a glitched font. 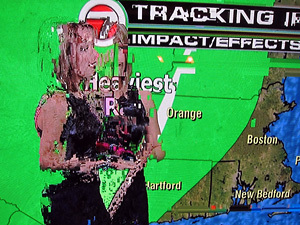 It is a continuation of Antonio Roberts's experiments with vector databending. 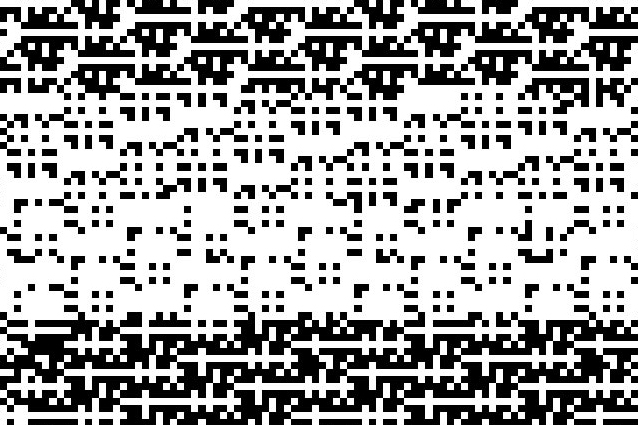 He has treated this as an open-source project, sharing his techniques and writing instructions for creating your own glitch typeface. Kim Asendorf created ExtraFile, a series of image formats as works of art in their own right, rather than strictly as tools. 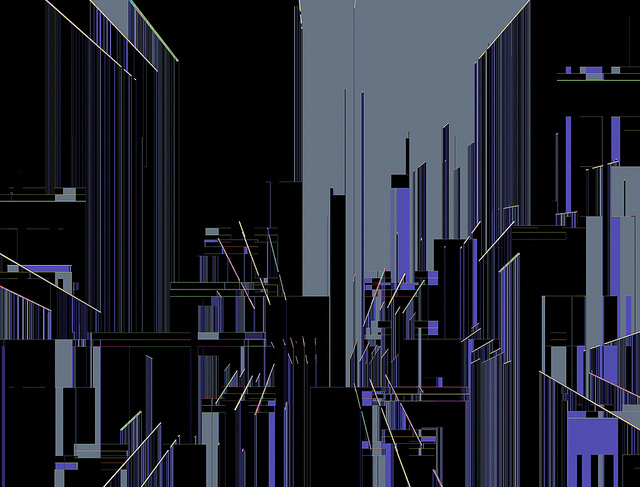 This image by Ben Baker-Smith explores the patterns arising from a manipulated ExtraFile-formatted image when broken.